Continuing on from part uno of my travel resources & tips. When I was younger my version of packing was to get everything I liked and put it into a suitcase, and hope it would magically make cute outfits. Now that I am a bit older and lover of blogs, I have found so many great tips and posts that I am convinced I can do Europe with a backpack, and Australia with a small suitcase (I would do a backpack, but I need room for all the food on the way back..). Pack less than you think you need. I gather everything (using polyvore) that I 'need' and then I remove one of each thing; tops, bottoms, dresses, shoes. I remove things that won't make at least 3 different looking outfits. Yeah that top could be worn with jeans, shorts and a dress - but will I actually wear it that way? Know yourself. I have to think of my style and how I will actually be on vacation. I love my denim jacket but it isn't as comfy as my cardigans or faux leather jacket, and I know I won't reach for it as often. Bring all of your underwear. Ok, maybe not all of your underwear. But it's the only thing I don't skimp on. I also bring a spare pair on the plane. Less is more with jewellery. I don't take a lot of jewellery because it gets tangled, it gets lost and it's not that important to me. Going to Aus, I will be wearing a lot of scarves so probably won't take necklaces but might take a few earrings - not my faves, because if I lost them - devastating. Going to Europe, I will most likely take a necklace or two. Minimal makeup. This one is easy for me because I'm not a makeup diva. I do like my mascara though, and travelling means pictures and I personally think I look better with a bit of makeup. If you think you are a bare faced beauty, rock it. For me, I will bring some mascara, foundation / powder, blush, bronzer & 1 eye shadow palette. Bring whatever works for you. I also love my makeup remover wipes for travel. You can always buy things at your destination. Apart from the food I want to bring back from Aus, I also want to buy some clothes. I miss my Aussie stores. In London I forgot to bring a 'going out' bag, could have done without but I bought one for less than $10 USD and I love it. I have random pieces of jewellry and clothes from my travels and they are some of the best souvenirs. 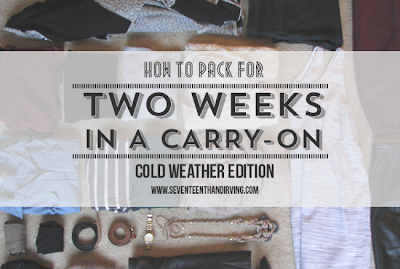 When it comes to travel, I struggle the most with packing. I just want to bring all of my favourite things, and have tons of options. But I am trying to learn from past vacations. Are you an overpacker as well? I know I'm not alone! We Took the Road Less Traveled - all of her posts. Hope Engaged - she has a ton of posts and great information. especially this one. Travel Fashion Girl - fabulous website for packing help and also tons of travel tips. I think that planning activities and things to do are dependent on what kind of person you are. I know a lot of people are all like, go with the flow and don't sweat the small stuff, and while I kind of agree, I am a planner by nature and I love love luh-ove having a loose itinerary and list of things I want to do. If you, by chance, like to plan as much as I do - I suggest lots and lots of reading. I love travel books, especially anything by Rick Steves, travel forums, blogs.. There is so much information out there and everyone is different - it's fantastic to see different points of views and experiences. Tripadvisor is a great resource to find things to do and places to eat as well. Open your mind! Try new things and new food and have a fabulous time. But stay safe. If you have common sense you should be fine. Lastly, I mentioned this in the tips #1 post, but I find it really helpful to keep a little notebook or journal with all your travel notes. I forget things easily, and I also just love writing things down. I write down everything from things to do, places to stay, tips on the culture etc. I can take it with me in my carry on, write notes and use it as a guidebook of sorts, rather than lugging around an actual guidebook. I am in no way an expert, just someone who has traveled a wee bit and wants to travel a whole lot more. I know I love reading about other peoples tips & resources, so it was fun to share it. Do you have any travel tips? Read any fabulous blogs that I don't have listed? Amazing experiences with your own travelling? Do share. All of these I agree with! I agree with thinking about what you will actually wear. I cant tell you how many times I've packed stuff that I honestly would never use .. you know because just in case. I know now how much nonsense that is! Id also say know how to fold/roll clothes so that more fits into one suitcase! So true, especially packing less than you think you need. I used to ALWAYS over pack, especially for beach vacations, I'd never wear any of it haha. Great tips! I love all the links that you included! I hope your Monday is great! Packing is sooo hard for me! Great tips girl! I think these are great tips. I have already been thinking about our upcoming 2 1/2 week trip Germany and how to save space (so that I can bring stuff back!). Hopefully I will be as successful as you! OMG I'm the worst packer. It always gives me so much anxiety. These are great tips though, definitely going to have to try some of these tips out! Great stuff! I love that you included all those blogs, now I have some good stuff to read during down time! Great tips! I'm not too bad at packing, but I could definitely pack lighter most of the time! My husband on the other hand always packs twice as much as I do! It's ridiculous. Love Rick Steve's stuff too - I'm a planner as well! Okay I might need your help next time I pack for vacation. I'm notorious for over packing and I never even use half the stuff I bring! Such a waste of space and my bag is always uber heavy, which makes backpacking especially difficult. I love Hope Engaged she has such beautiful pictures that make me long to go traveling. I hope you're having fun in Australia!! This is such a helpful post + all the other resources! I'm with you and used to pack crazy when I was younger- literally pack multiple coats and shoes and things that I really didn't need! Now I'm usually an underpacker, which isn't the best, but it makes for easier packing most of the time! Good tips! I always, ALWAYS over pack and never wear most of what I pack! After my first few trips, I definitely learned to pack less than I thought I needed. And when everything is on my back, I definitely re-wear stuff :) I usually don't bring jewelry because I don't want to be a target either. Great post! Great info, Kristen! I am so with you girl. I bring like twice the amount of undies I think I should need.....and seem to always go through it. Also I always think if I really forget something like they do have stores where I am going! Miss you!!!! I always back lots and lots of underwear. Basically, if they fit they are coming. I have my packing down, I can be packed for a week in about 15 minutes! Boom! Some people get so overwhelmed though, so this is a great post with lots of resources! I pack like I'm moving there. Then I end up not wearing half of it. I always bring all my good underwear, though! You never know when you're gonna need extra underwear, it's one thing I do not want to be out of. I was hoping after reading your last post, you would talk more about packing. Thanks for all the good resources. I'm gonna need them because I have no clue how to pack enough for two weeks in Africa into ONE suitcase. Major over-packer here.